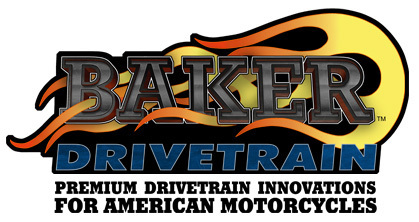 When I found out that Baker Drivetrain manufactured a new oil pan for 1993 to 2008 FLH Harley-Davidson models, I was interested. Hell, it held an extra quart of oil, so I installed one on my 2004 FLHTI. 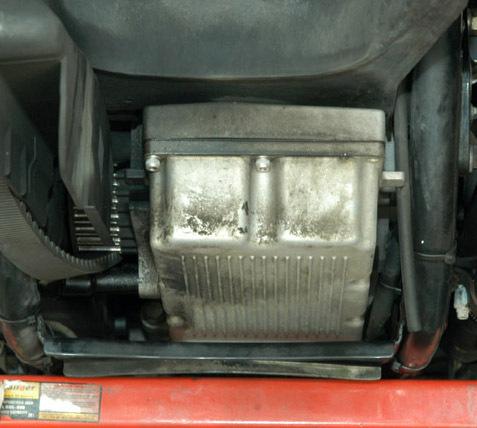 An extra quart of oil in the system is a sure way to lower engine oil temperature and add to the life of the engine. The pan is made from Cast A356-T6 Aluminum and available in Polished, Black or Silver and also in Chrome Plated Billet Aluminum. They come ready to install with all hardware and gasket, except for the stabilizer hiem joint. 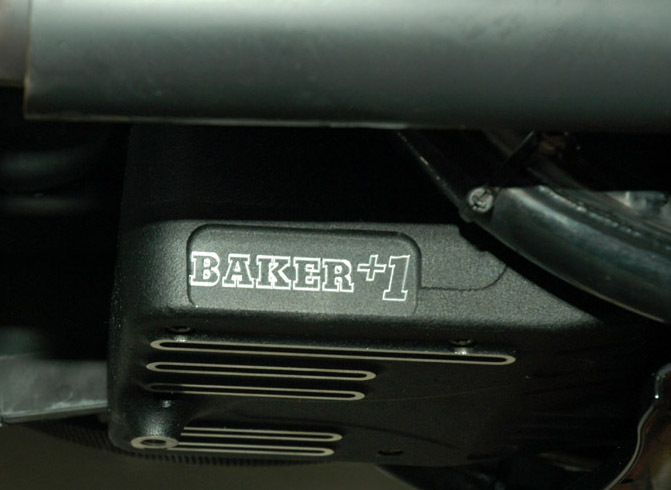 They also incorporated additional features like built in baffles so you do not have to use the stock plastic Harley baffle. The oil feed tube has been moved to the rear of the pan while the return is still in the front. 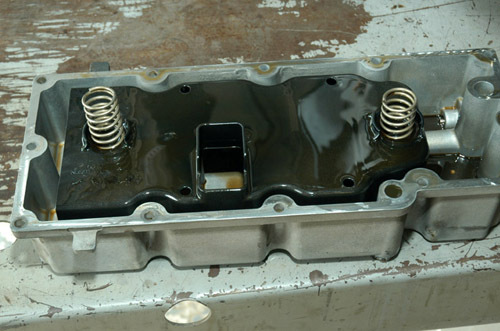 The oil circulates and cools more before re-entering the engine with this design. They also incorporated the True-Track handling system by building in the stabilizer boss. That was an incredible addition, since True- Track like systems improve dresser handling immensely. 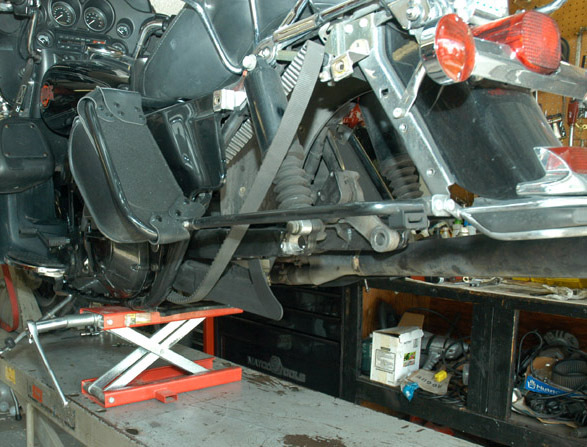 Installation was easy, but care must be taken that the motorcycle is secure and stable during the procedure. In other words tie it down tight before jacking it up. Please note that the procedure may vary slightly depending on your model, and you should refer to the factory service manual for your motorcycle. See his wife's pan there. He's in trouble again. I started by draining the engine and transmission fluids. I removed the engine oil dipstick so as not to damage it when removing the oil pan. While the fluids were draining, I removed the saddle bags. Frame jack to remove the rear wheel. Using a long 3/16 ball hex socket I removed the ¼-20 bolts holding the pan in place. There are holes in the frame crossmember that allow you access to the center ones. I used a frame jack to raise the motorcycle to remove the rear wheel being careful the jack was positioned forward and not under the frame crossmember. You may want to cut a couple of short 4-by-4s and place them under the frame rails so you can remove the jack. 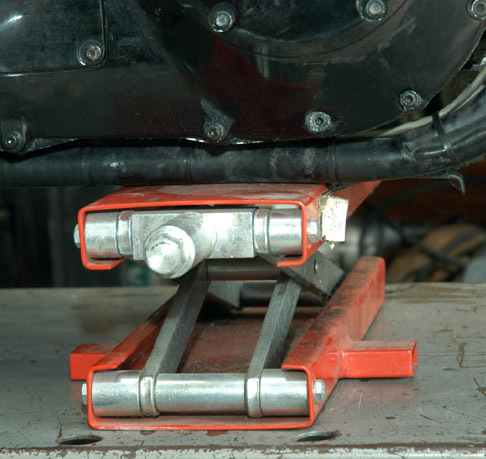 That will give you more access to your work area under the motorcycle. Using a different jack and a small block of wood placed under the engine case, making sure it clears the frame rails, I raised the engine and transmission slightly to have clearance between them and the rear crossmember when the oil pan was changed. Here's the stock pan removed with baffles still inside. 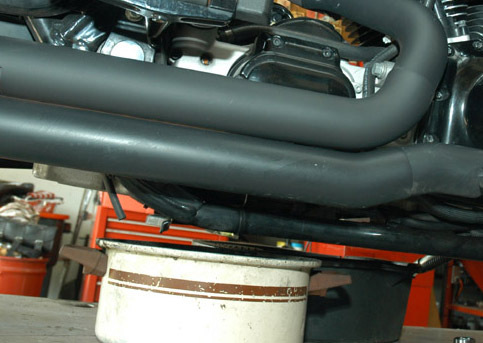 Depending on the model of the motorcycle and the exhaust system some parts may need to be removed. In my case, I was required to remove the muffler from the saddlebag support. I also removed the left side passenger floorboard, both lower shock mounting bolts, chrome swingarm bracket plugs and the nut from the right side of the swingarm shaft. Then I removed the left swing arm bracket and rubber mount and push the shaft to the left side of the motorcycle. I carefully raised the jack under the engine until the transmission tail section was about one inch above its original position. I slid the stock oil pan to the rear of the motorcycle. Compressing the baffle spring with a screw driver or other suitable tool, I removed the stock bag from my precious dresser. The new Baker Plus One Oil Bag. Blue Locktite was a must on all bolts. With the Baker pan in place I started all bolts in a few turns, checked that all bolts were through and not binding the gasket. I tightened starting in the center and working to front and rear. When pan touched the transmission, I followed the torque sequence in the instructions and tightened it to 90 INCH LBS--Repeat at 110 INCH LBS. Next I needed to lower the jack under the engine until the transmission was in line with the rear mounts. If you were careful the right side would not need to be moved. I checked to make sure that the index tab was in the slot of the rubber mount. I applied Anti-Seize to the shaft and inserted it from the left side of the motorcycle through both rubber mounts. Torque the shaft to 40-45 FOOT LBS. I installed the left side swingarm bracket and torque it to 34-42 FOOT LBS. If you are not familiar with this procedure follow instructions in Factory Service Manual. I installed the rear wheel, checked belt tension, replaced any exhaust parts, and I remembered to operate the rear brake lever a few times to make sure the brake pads were back in position against the rotor. I started using Spectro oil recently, since they sponsor Bikernet. 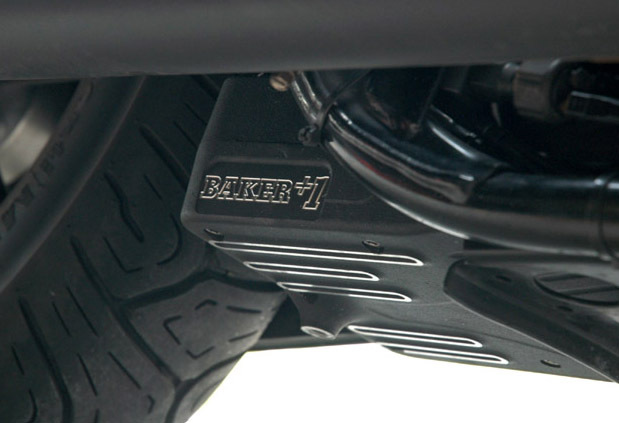 I used 24 ounces of their Heavy Duty 6-Speed Full Synthetic in the transmission. Yeah, I know I have a 5-Speed but this has some extra additives and works great. For the engine I used Spectro Full Synthetic SAE 20W-50. Yes I did change the oil filter. My Primary oil was due for a change so that got the Spectro Heavy Duty Chaincase oil. I installed the Baker pan over a month ago. I noticed the engine running cooler and also a slight increase in oil pressure. 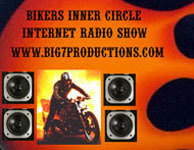 That will sure be a benefit on my upcoming trip to Sturgis. Now if I can only figure out what to do about the price of gas, I will let you know.